The patterns are in PDF format. When printing, make sure the 'Shrink to Fit' or 'Fit to Page' options are not selected and make sure the printed pattern is the size you are expecting. As you make your Quilter's Diary, it's fun to keep the blocks organized as you collect them. I used the Button Basket pattern for the front and embellished it with matching buttons. Inside there is a pocket to store supplies, a buttoned flap to keep your blocks in place, and batting "pages" hold your patchwork pieces as you work on the blocks. I love Baltimore Album quilts! But I also love to applique quick and easy fun designs. 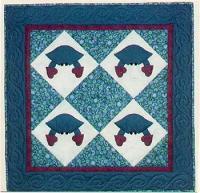 These crabs are just another type of Baltimore quilt! Make the quilt with blue fabric to show crabs in the Chesapeake Bay or stitch it in red to represent the steamed crabs we love to eat here in Baltimore!